Coconut Oil has been around forever, but right now is a new fad in nutrition because of the great benefits in nutrition and effects on the body digestion compared to other oils. 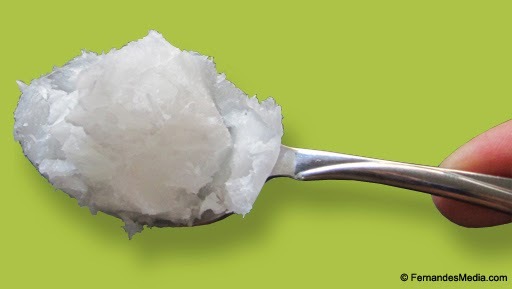 Coconut oil can be great for skincare for many of the same benefits. The huge amount of lauric acid and Omega 3 and 6 in coconut oil helps with acne, skin disease, UV rays, boost collagen and moisturize. Lauric Acid is the main fatty acid in coconut oil, which has great anti-virol and anti-microbial properties to help with skin disease and acne. Lauric acid is otherwise found naturally in human breast milk to help babies with their immune system. Using coconut oil in your diet gives a whopping seven grams of lauric acid per tablespoon, which helps fights viruses and bacteria, also helping with metabolism and promoting healthy hair and skin. The human body turns lauric acid into monolaurin, which contains antiviral, antimicrobial, antiprotozoal and antifungal properties, so basically, it boosts your immunity in every possible way. Rich in Omega-6 and Omega-3, a 3:1 ratio, where other oils are a more unhealthy ratio of 15:1, Omega oils ad antioxidants to help in skin repair, and help with skin disease. Omega 3 and 6 have shown to have properties that block UV rays, allowing for added protection to the environment. The fatty oils give a rich moisturizer that is natural and healthy for the skin. - Kills viruses that cause influenza, herpes, measles, hepatitis C, SARS, AIDS, and other illnesses. - Kills bacteria that cause acne, ulcers, throat infections, urinary tract infections, gum disease and cavities, pneumonia, and gonorrhea, and other diseases. - Kills fungi and yeasts that cause candidiasis, ringworm, athlete's foot, thrush, diaper rash, and other infections. - Expels or kills tapeworms, lice, giardia, and other parasites. - Functions as a protective antioxidant. - Protects skin from harmful free radicals that promote premature aging and degenerative disease. - Does not deplete the body's antioxidant reserves like other oils do. - Improves utilization of essential fatty acids and protects them from oxidation. - Supports tissue healing and repair. - Applied topically helps to form a chemical barrier on the skin to ward of infection. - Reduces symptoms associated the psoriasis, eczema, and dermatitis. - Supports the natural chemical balance of the skin. - Softens skin and helps relieve dryness and flaking. - Prevents wrinkles, sagging skin, and age spots. - Promotes healthy looking hair and complexion. - Provides protection from damaging effects of ultraviolet radiation from the sun. - Has no harmful or discomforting side effects. - Is completely non-toxic to humans. - Helps protect the body from skin, breast, colon, and other cancers. - Provides a nutritional source of quick energy. - Boosts energy and endurance, enhancing physical and athletic performance. - Improves digestion and absorption of other nutrients including vitamins, minerals, and amino acids. - Improves insulin secretion and utilization of blood glucose. - Relieves stress on pancreas and enzyme systems of the body. - Reduces symptoms associated with pancreatitis. - Helps relieve symptoms and reduce health risks associated with diabetes. - Reduces problems associated with malabsorption syndrome and cystic fibrosis. - calcium and magnesium absorption and supports the development of strong bones and teeth. - Helps protect against osteoporosis. - Helps relieve symptoms associated with gallbladder disease. - Relieves symptoms with Crohn's disease, ulcerative colitis, and stomach ulcers. - Improves digestion and bowel function. - Relieves pain and irritation caused by hemorrhoids. - Supports and aids immune system function. - Is heart healthy; improves cholesterol ratio reducing risk of heart disease. - Protects arteries from injury that causes atherosclerosis and thus protects against heart disease. - Helps prevent periodontal disease and tooth decay. - Helps relieve symptoms associated with chronic fatigue syndrome. - Relieves symptoms associated with benign prostatic hyperplasia (prostate enlargement). - Helps protect against kidney disease and bladder infections. - Helps prevent liver disease. - Is lower in calories than all other fats. - Promotes loss of excess weight by increasing metabolic rate. - Is utilized by the body to produce energy in preference to being stored as body fat like other dietary fats. - Helps prevent obesity and overweight problems. - Does not form harmful by-products when heated to normal cooking temperature like other vegetable oils do.